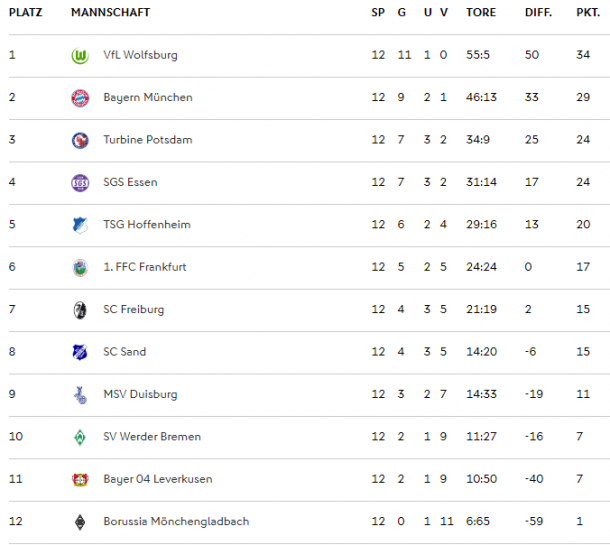 Already into the second half of the season, it was very much business as usual in Germany as Wolfsburg saw of Frankfurt, Leverkusen shipped eight to Munich, ‘Gladbach finished on the wrong side of a 5-0 loss to Werder and Essen hit six of the best past Duisburg. Elsewhere, Sand claimed a worthwhile point in Freiburg as Hoffenheim and Potsdam battled to a draw. A goal to the good four minutes in when Alex Popp nipped the ball into the net from a free-flowing move that saw her set up by Ewa Pajor, the Wolves barely paused for breath in Frankfurt. The visitors doubled their lead 20 minutes later when Pernille Harder sent the ball across the box for Caroline Graham Hansen to hammer home before the Norwegian lashed a penalty beyond Bryane Heaberlin. The hosts were given hope of a comeback just before the break when Tanja Pawollek reduced the deficit with a curt strike from just outside the area, slotting the ball between Almuth Schult and her upright. Laura Freigang’s super solo goal made it 2-3 before the Wolves hit the afterburners to pull away from FFC, not in the mood to drop any more points this week. Harder reopened the gap three minutes later, knocking a pining corner over the line before Lena Goeßling opened her account for the season, nodding the ball home from two-yards out. Three goals to the good there was still time for Zsanett Jakabfi to mark her 200th appearance for Wolfsburg with her 50th goal for the Wolves, scooping Hansen’s low pass into the bottom corner. Having a season to forget, Werder were able to improve their lot with a win over bottom-placed ‘Gladbach. With the teams level at the break, the hosts scored three in nine second half minutes to leave themselves in complete control of the tie. Michelle Ulbrich’s header enough to get Bremen going, Selina Cerci’s neat close-range finish two minutes later leaving Borussia with little room for a comeback. The match rubber-stamped seven minutes later when Alicia Kersten raced in behind, slotting the ball between Lisa Venrath’s ankles before rolling it into the unguarded net. 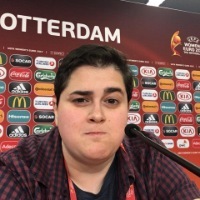 With the match already won the hosts added a fourth 15 minutes from time through Hungarian international Gabriella Tóth who nodded the ball in at the back stick before Cerci clipped the ball under Venrath. Having been denied a striking goal earlier in the season, Nadine Prohaska finally broke her duck for Sand in sublime fashion, the Austrian international slotting the ball just under the bar from 30-yards. In a match that fast became about summer signings, Desiree van Lunteren restored parity early in the second half with a low finish under Carina Schlüter’s outstretched leg. The hosts took the lead just four minutes later through Sharon Beck’s diving header before Marina Georgieva nodded an equaliser in at the back post. Taking the lead on the half hour when Kathleen Radtke awkwardly nodded Lea Schüller’s header beyond Meike Kämper, Essen added a second just before the break as Marina Hegering volleyed Schüller’s flick in at the far post. Two became three ten minutes into the second half when Schüller fired Lena Ostermeier’s rebound into the empty net before Sarah Freutel slipped the ball between Kämper’s ankles six minutes later. Needing just five minutes after being substituted on, Ramona Petzelberger added the fifth with a flying header. 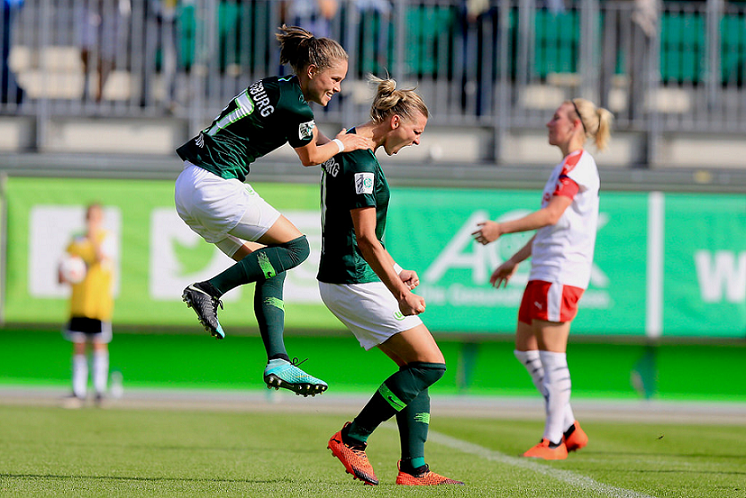 Schüller notched the sixth and final goal of the match – and her tenth of the season – five minutes later, firing the ball high into the net. In a run of matches that’s helping boost their goal difference, Munich showed little restraint against a defensively feeble Leverkusen. Needing two thirds of the first half to find the breakthrough, Mandy Islacker made no mistakes when she found herself played through and one-on-one with Laura Sieger. Islacker’s second of the afternoon arriving four minutes later when Lineth Beerensteyn’s useful block saw the ball drop to her feet, the experienced striker happy to lift the ball over Sieger. The second half saw the floodgates open for the hosts as the rain continued to fall in Bavaria, Lina Magull’s low finish enough to cap off a flowing move. Sara Däbritz’s gambit enough for a fourth before Islacker wrapped up her hattrick three minutes later with a curler from the right side of the box. Verena Schweers grabbed the sixth with a low drive as Leverkusen were overrun in the box, the visitors shipping their seventh of the match as Beerensteyn poked the ball home from four-yards out. The win rounded off at the death by Fridolina Rolfö when she fired the ball high into the net from the right side of the box. Fresh off taking points off of Wolfsburg in the midweek, the Turbines were given another stern test as they faced a consistently-improving Hoffenheim. Having refused a handful of chances to take the lead in the first half, Potsdam found the break through five minutes after the break when Lara Prašnikar volleyed a flicked-on free kick under the bar and in. The lead lasted just five minutes however, TSG drawing level courtesy of Nicole Billa’s arrowed into the bottom left corner. Knocking at the door for a winner, especially through Felicitas Rauch’s free kicks, the hosts were unable to get the better of Friederike Abt for a second time and lose pace on the top two.